The great room features one flat screen for all of its four areas, speakers that have been painted to blend into the ceiling, and a mural that was hand-painted over the speaker cloth.This is the story of an all-American lake house, a dream built on land held in the family for years, and a home selectively infused with 21st century technology installed at a pace timed to grow with the owners needs and desires. 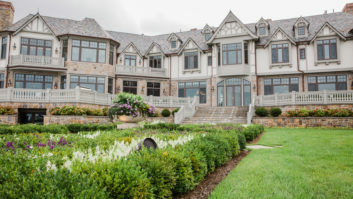 The 9,700-square-foot residence on Iowas West Okoboji Lake was designed by Cannon Moss Brygger & Associates Architects, of Spencer, Iowaunder lead designer, Matt Barstadto complement the ambiance of the lakes region. The lodge-style retreat, with cottage and craftsman influences and nature-driven motifs, was built as a permanent residence for a couple whose business is electronics distribution. The house features a separate two-story, elevator-equipped apartment for family members. The project was three years in the making, a testament to the clients attention to detail, says Scott Vande Vegte, president of Amani, a Sioux Center, IA, integrator. Amani, with seven employees, specializes in projects within an 80-mile radius, including Sioux Falls, Sioux City, and Iowas lake region. About 25-percent of its projects are residential. We had done some previous work for the client in his corporate offices but nothing to the extent of the design and installation for the lake house, Vande Vegte said. This client is savvy about electronics, and he spent a long time deciding on the right amenities for the house. He wanted music throughout, lighting control, and a security system with video surveillance. He knew the pitfalls of installing different systems that didnt work well together, and he wanted a system that was fairly simple to operate. The first phase of the installation featured a Lutron HomeWorks system with Wired Series 8 Processorprovided by the client with design and installation by Amania Crestron Adagio AES for whole-house audio, TruAudio speakers, and surveillance and security controls for TVs and video. The couple had stayed in homes that had Crestron systems, and the AES was a good fit for this value-conscious project which is at about $115,000 to date, Vande Vegte said. Amani also included an Escient Fireball DVDM-100 Manager from the start. When you have a client with a long-term project in mind, you need to start thinking way ahead of what they envision and you need to work with the architects, he said. For instance, in the kitchen, we did a lot of wiring into the island for control points down the road for flat panels and touch panels. A year after the initial work, a Crestron TPMC-8X WiFi touch panel was added, Crestron’s TPMC-8X WiFi touch panel provides systems control from one spot and allows the client to monitor surveillance camera views.providing systems control from one spot and allowing the client to monitor surveillance camera views. We brought in integrated lighting control at that time, Vande Vegte explained. The clients were already using four ML600 hand-held remotes configured for each area, but they wanted to be able to go through the house with the 8X as well as have the ability to access lighting control from that device. We also changed the HDTV system from the local cable to the Dish Network HDTV system. The AV challenges for Amani were largely aesthetic, he noted. All the woodwork was custom-made and all the electronics were installed to blend in, he said, including 56 TruAudio CPI-8 and CF-8 ceiling speakers, and two CS-12 subwoofers. TruAudio offers bang for the buck. The whole-house audio feeds into the apartment as well, where there are keypads. The great room with its large fireplace, bar area, kitchen, and dining room flow seamlessly into each other, and the client wanted to have one flat screen for all four areas. Amani had a custom arm made that pulls out and spins the 50-inch LG flat screen around 90-degrees, then tucks it back into a 30-inch wide cabinet. In addition, great room speakers have been painted to blend into the ceiling, and a mural was hand-painted over the speaker cloth. The home has some 140 lighting zones featuring sconces, chandeliers, and recessed lights. The loads are both local and centralized, Vande Vegte said, and the challenge came in mixing all this lighting with the space to avoid wall clutter while maintaining the economics and ease of use of the system. The home has some 140 lighting zones featuring sconces, chandeliers, and recessed lights.Nowhere in the house is the tech designed to be less obvious than in a sunroomadjacent to the great room. A creek running directly underneath the sunroom creates waterfalls, which can be seen through windows on the lower level. The sunroom is all about aesthetics and whatever tech is in therelighting control and background audiois not meant to be seen. Programming for the Crestron system was done by Dave Newton, CTO, Elexos Corporation, of Rosemount, Illinois. This was our first Adagio system. It was brand new and there were some good learning curves, he said. We had the chance to learn how the product worked from Crestrons standpoint; theres a lot of built-in functionality thats not typically built into the Crestron products. We had to learn what was in there that the user might be expecting because with Adagio, Crestron defines it for you and there were some nice features. We had to push it to the next level to develop custom interfaces to integrate products such as the Escient and cable boxes for music that were not supported natively by the Adagio line. Newton returned a year later for the upgrade to AV and lighting integration and more. The (TPMC 8X) panel gave the client the chance to browse the Internet using it and to gain easier interface for the surveillance cameras, he said. On a small system its common to come back and add in. On larger systems, you rarely go back unless theres some new tech as far as media content. The next phase of the project features an upgrade for a media room on the lower level, Vande Vegte said. Well add onto the Adagio system, integrating a new surround sound system to replace an older one the client has. Well also be able to provide e-control for the house, tying in the HVAC. Weve already put in communicating thermostats for the ground source heat pumps and will tie that into e-control as well. The first phase of the installation featured a Lutron HomeWorks system with Wired Series 8 Processor-provided by the client with design and installation by Amani-a Crestron Adagio AES for whole-house audio, TruAudio speakers, surveillance and security controls for TVs and video, as well an Escient Fireball DVDM-100 Manager. The piece-by-piece approach can be successful if careful planning is done, he says. We made sure theres a place in master bath for the TV, and we have in place the conduits to feed wiring to the dock and out-buildings. There are outdoor speakers on the patio between the master bedroom and great room on the main floor, in the soffit on the lower level and in the ceiling beneath the sunroom, and at some point we will tie the speakers into the dock. Well also add more lighting controls and a touch panel on the lower level to a bar area. The drawings for the bar are finished and weve put in conduits. The point is that we had the conceptual plans from the beginning. Otherwise, you have to tear up floors. The clients are also planning to build a gazebo/fire pit area in the future, Vande Vegte said. A gazebo may seem like an easy project, but if you miss it initially, it can be difficult to get the wiring in later on. The keys for long-term projects are patience and time spent getting to know how the client will use the space, now and tomorrow, he said. A lot of out clients havent had exposure to some of the newer technology. Its our responsibility to give them an eye-opener, and that makes it interesting. Most people remember the day when they didnt have power windows in their cars. Once you get used to something, its no longer an option.